Because adding and subtracting are "inverse" operations, we can convert any subtraction operation into an addition. And because adding is much more ""straight forward", changing a subtraction to an addition could make doing the operation much easier. Even though we have only applied this. 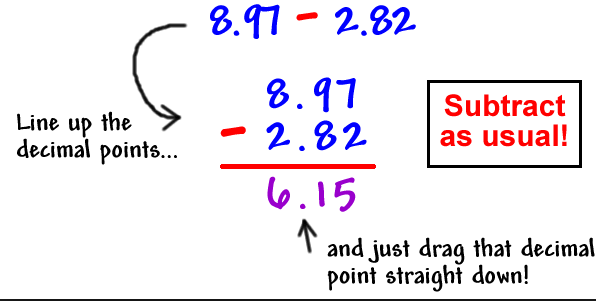 method when dealing with integers, you can "add the opposite" when dealing with the subtraction of all other rational numbers (fractions, decimals, and mixed numbers). - When adding and subtracting fractions, your primary goal is to find a COMMON DENOMINATOR. - Once both fractions have been modified and have the same denominator: THE DENOMINATOR does NOT change, and the numerators are subtracted. (whether you add the opposite or not). - Convert all mixed numbers to improper fractions. - If required, convert the resulting fraction back to a mix number.